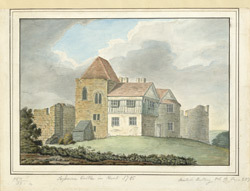 View of Leybourne Castle in Kent, showing a house built into the ruins of the castle. The castle remains seen here date from the 13th and 14th centuries but the site is much older. The castle was home to the de Leybourne family since the reign of Richard I. After the family died out there was a long line of owners. By the late 18th century, it was owned by the Hawley's, who were vicars of Leybourne Castle.